I have a past life. Before Easter, I shared a little bit of chocolate love and the fact that my last job was designing chocolate biscuits (cookies) for Australia’s largest biscuit company. But it’s been ages since I spoke about my other life B.C. (before chocolate). I used to be a wine maker. Yes, before I got paid to eat chocolate for a living, I used to get paid to make and drink wine. Although I should also point out the less-than-glamorous fact that I also got paid to spit out said wine. When I was studying to be a winemaker, we spent a lot of time learning about flavours and how our bodies perceive them. We also covered a lot about balancing flavours in wine as well as how to pair wine with food. I didn’t realise it at the time, but that knowledge helped be become a better cook. It taught me how to balance flavours in food, another name for the gentle art of seasoning. It also taught me how to imagine or ‘predict’ what two wines (or ingredients) would taste like when they were combined together. So what is the 1 thing you should NEVER do when combining flavours? Simple. You should never ignore your instincts. Even if you’re not super confident in the kitchen, you have YEARS of experience as an eater. Those three-meals-a-day have taught you more than you realise about which flavours work well together, and those that don’t. And more importantly, you are the only one who has experienced exactly how your taste buds and nose perceive different flavours. So you are the world expert on what will work for you. Speaking from experience, if I think a combination isn’t going to taste that great, more often than not it’s a disappointment. So these days I trust my instincts and so should you. Like to learn more about combining flavours? Pick up a copy of my ebook ‘The 2-Minute Meal Plan System’ and you’ll also get a free bonus copy of my ‘Flavour Directory’ ebook. :: The 7 golden rules of flavour pairing. :: Flavour profiles & classic ingredients from around the world. 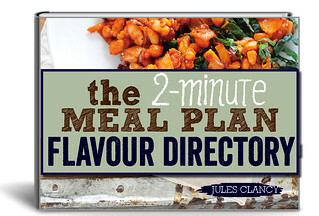 Inspired by Niki Segnit from The Flavour Thesaurus [affiliate link]. I know this dish sounds way too simple to be any good. But trust me, you’re in for a real treat! The red capsicum cooks down and releases its sweet juices to form the most heavenly sauce. I like to serve this simply with a fresh green salad to mop up the juices. Steamed rice or crusty bread could also be used. 2. 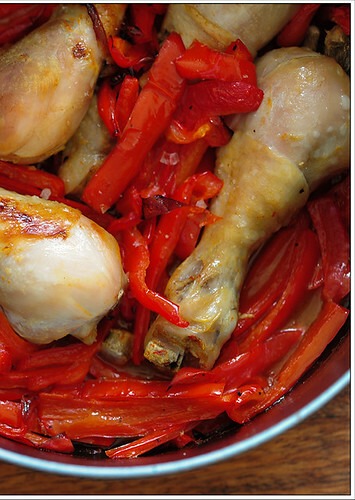 Place chicken in an oven proof dish. Top with sliced capsicum (peppers). Drizzle generously with olive oil. Season. 3. Bake covered for about 30 minutes. 4. 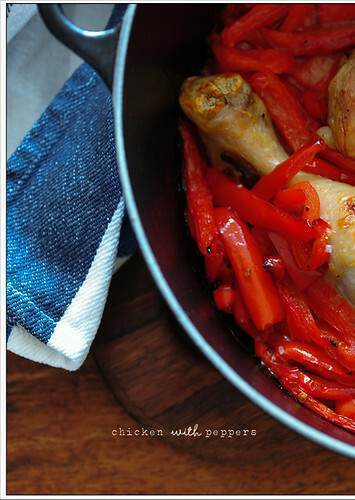 Remove the lid and bake until the peppers are reduced and tender and the chicken is golden and cooked, about another 20-30 minutes. vegan – replace the drumsticks with field or portabello mushrooms. You probably won’t need to cook as long. 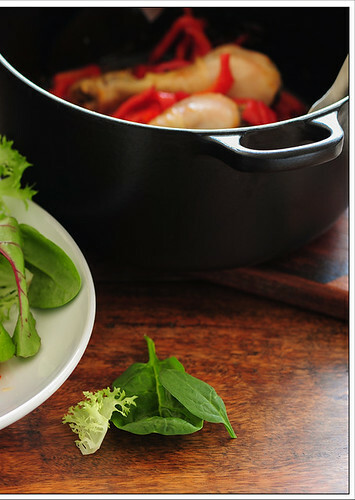 vegetarian – cook the peppers as described above without the chicken. Use the cooked peppers as a sauce to serve with pan fried halloumi. hot! 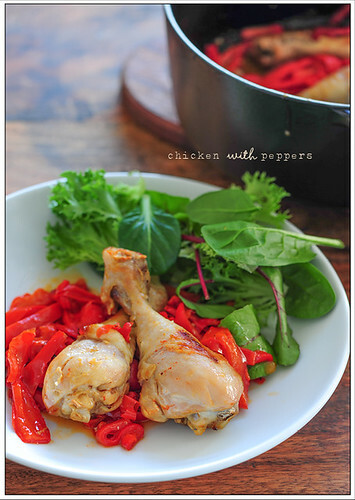 – pop in a few or more red chillies with the capsicum. 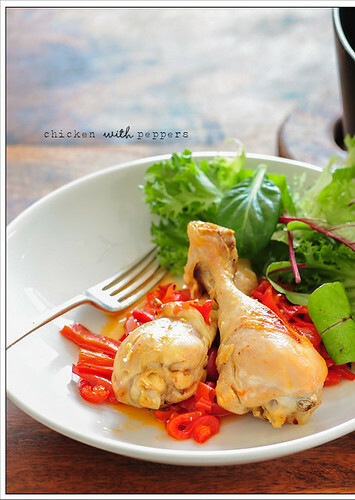 smoky – sprinkle 1-2 teaspoons smoked paprika over the chicken to intensify the sweet capsicum (pepper) flavour. different veg – feel free to add in some chopped red onion or whole cloves of garlic. Yellow capsicum (peppers) can also be used but don’t bother trying green ones. budget – reduce the amount of chicken per person and add in a drained can of chickpeas. I think that goes for just about everything in life, not just cooking. You should always listen to your gut. yes, listening to your gut, to your heart, to who you are! i’ve learned so much about that in the past year… although for cooking, i kinda feel like, if i’ve got a doubt about seasoning, i should just keep it simple: salt & pepper. 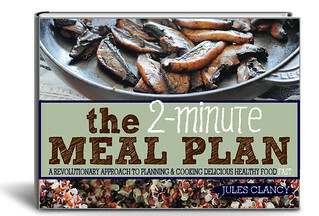 The way recipes should be: short, simple and healthy! Love your site. One thing I noticed in your Thai curry noodle photo–in an asian dinner, one should never rest the chopsticks “head first” into the bowl. Always at the side of the bowl or on a rest. It’s considered rude and bad luck and symbolizes all sorts of awful things that don’t really mean anything. Just thought you might want to pass that along to your food stylist! thanks for the heads up Aye! Delicious recipe … made it for friends and it was a hit! Served with a rice salad and greens. Thanks for the recipe, do you think adding Potatoes or Eggplant would work with this?